Sailing has its own unique language. This makes it unapproachable in ways that differ from other expensive sports. As with most cultures, without a basic understanding of the language you are an outsider. I learned that first hand at the US Sail Boat Show in Annapolis. If, like me, you only understand a few sailing terms then you are limited to very basic conversations. Compared to sailing, horseback riding is another expensive sport. But, I think riding would be much more approachable because everyone can identify the basic parts of a horse. 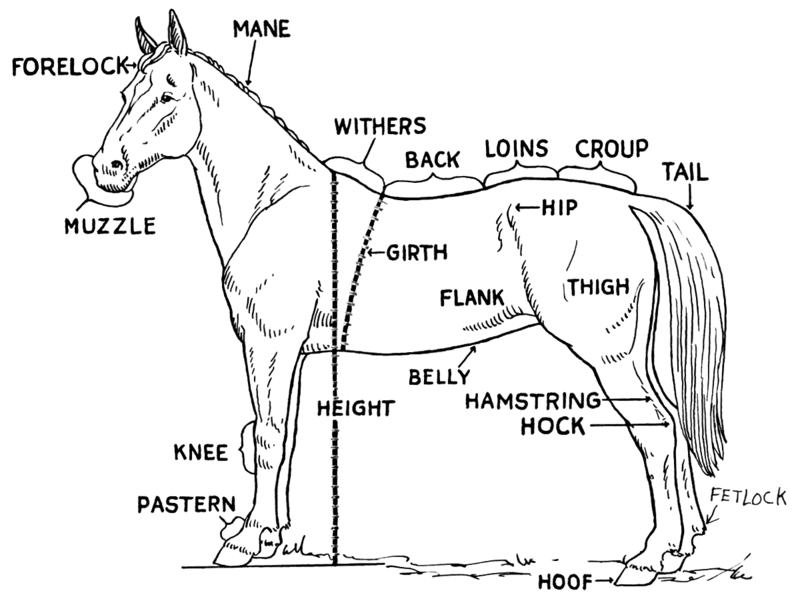 Parts like legs, head, nose, rump, hooves and so on provide beginners with immediate entry points to conversation. In the diagram below, some of the terms are unfamiliar to me, but not beyond the realm of comprehension. In sailing this is not the case. A bathroom is a head, and I’m still sorting out my lefts (port) and rights (starboard). My conversations with sailors and brokers are limited and can end rather awkwardly. Learning the language of sailing is essential to me, and it seems to me that the best entry point is formal training. To this end, I will be in Antigua in April 2015, leaving my family without me for 3 weeks, to attend practical training around the Antigua Sailing Week. By that time, I will have completed the RYA on-line Day Skipper program and a radio course. I plan to start the on-line program next week when my children are back in school. And, I am sending our twins to daycare for the first time so that I have time to focus on this training. To give you a sense of where I am now I thought I’d end this post with an excerpt from the book: Chapman Piloting Seamanship and Small Boat Handling, 63rd edition, 1999, page 230. This text requires great effort for me to read. I have deliberately mangled a passage of text from this book as it provides a window into what it’s like to be complete sailing rookie. The text is about reaching, which – I gather is about “Catching the wind with your sail”. So here goes my interpretation of reaching. Most boats are on their fastest point of sail when the sail billows out very far, and the mast is turned perpendicular to the boat to catch the wind. But, caution must be taken: Continued care is required to maintain the boat’s balance. The tendency of the boat to follow the direction of the wind is usually strongest when the sail and the mast basically follow the same direction as the length of the boat. A main sail that is too tight will tend to do very little to combat the tendency of the boat to follow the direction of the wind, and to luff. Bearing a way from a close-hauled course onto a reach is a technique that puts most boats onto their fastest point of sail. But caution must be taken whenever this maneuver is put into practice: Continued care is required in order to maintain the boat’s balance. Weather helm, as the boat tries to round up into the wind, is usually strongest on a close reach because an over-trimmed main will tend to keep the center of effort back and to twist the boat into the wind. Except for the term “Weather helm” in the original text, I didn’t use any outside research as I read the text. I knew the term “luffing” so I thought I’d add luff into a sentence. Someday soon I will look back at my interpretive text and laugh, I think.